Asia’s acrylonitrile-butadiene-styrene (ABS) market has remained weak with prices drifting lower in the Chinese spot market, and regional buying interest likely to stay tepid in the near term. “There is no improvement in demand in sight,” said a trader in China. Buyers and traders continued to keep lean stocks and were buying on a need-to basis. The region’s manufacturing sector has entered a lull season towards year end, and the ongoing US-China trade war has also dampened sentiment and prompted users to remain cautious. “Most customers kept purchases small in view of declining prices and slower orders for finished goods,” said a producer in Taiwan. ABS is used for appliances, toys, consumer electronics as well as in the automotive and construction sectors. Some producers have scaled back output at their facilities to keep inventories manageable. However, poor demand in the key Chinese market still resulted in ample stocks in the region. Despite the fall in feedstock costs, margins of ABS have not improved substantially since resin prices fell in tandem. Some sellers deemed the current stocks of resins available were made from higher-priced feedstock purchased earlier, hence, margins remained squeezed. 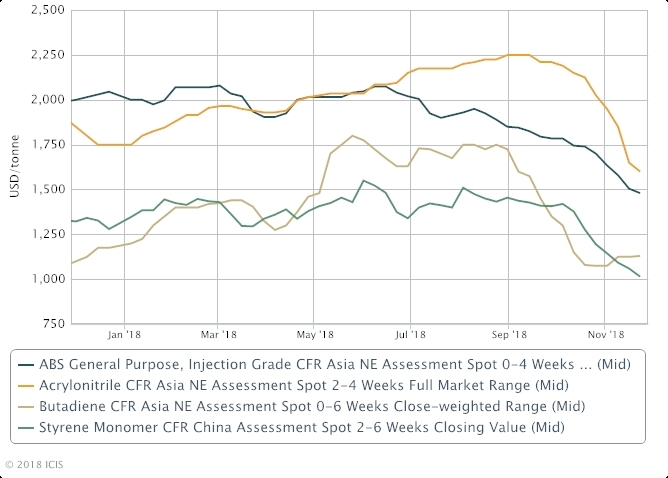 “Customers are expecting even lower resin prices since feedstock values have mostly declined over the past month,” said a southeast Asia-based producer.